Yummy Yankee Thrift | Food It Yourself! As Americans, we like to define ourselves by our heritage- we call ourselves by the nationality of our ancestors. Yes, I frequently refer to myself as “Italian-American”. However, I am at heart an ethnic Yankee. One of my life mottos is the old New England adage “Use it up, wear it out, make it do or do without.” For this reason, wasting food disturbs me. I will freely admit that I am as guilty as the typical American of leaving lettuce to get slimy in the crisper and forgetting about that half-used bag of lentils at the back of the pantry. It still pains me to throw out food I know I could have eaten. Thankfully, my husband is a clever fellow. In March or April of this year (It may even have been February!) I bought a 5lb bag of potatoes and used about ¾ of them. In late May, my husband found the remaining spuds in the cabinet behind the spring roll wrappers. Here’s what the bag looked like when my husband discovered it. I was debating whether to toss it in the compost or the trash.. he had other plans. 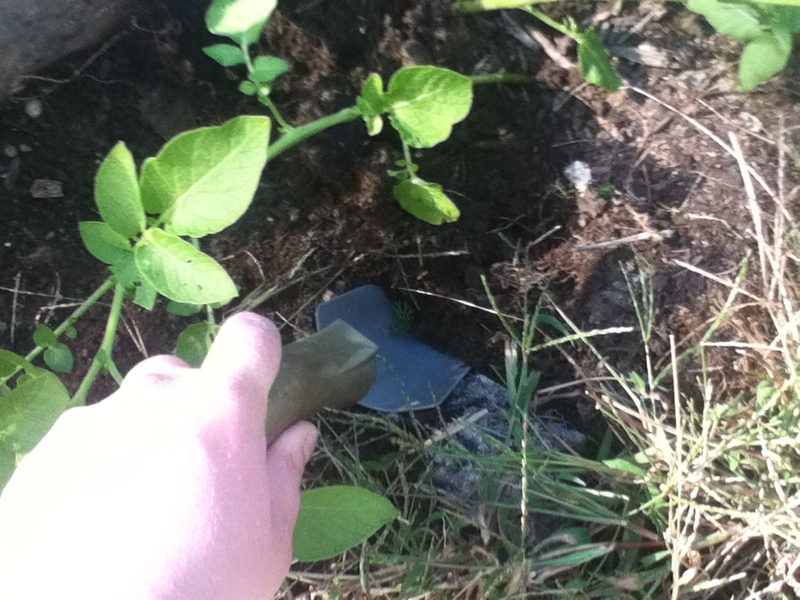 Being a thrifty fellow himself, he planted the potatoes on the pumpkin patch. They not only survived, but thrived! 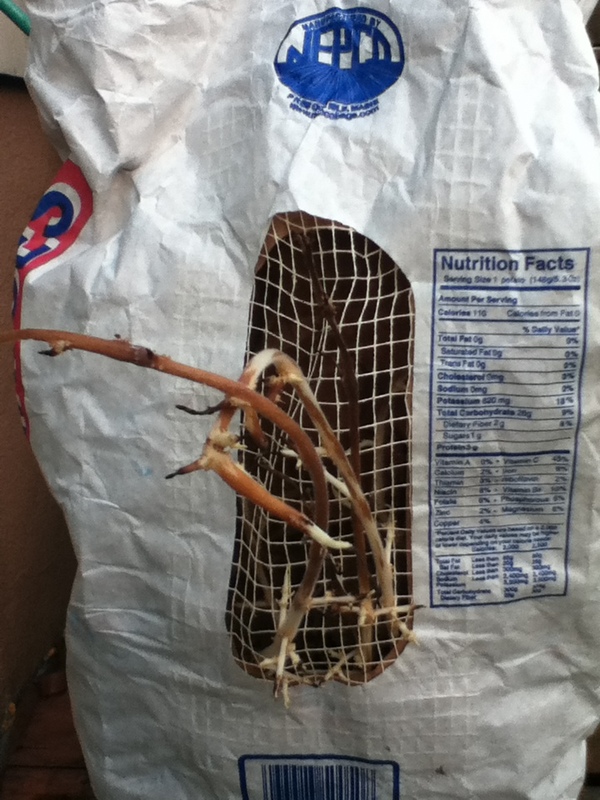 Being a potato-growing novice, I had to scour the web for information on when and how to harvest any potential potatoes this experiment in thrift might yield. Here are the flourishing potato plants. I couldn’t resist digging up a few “new” potatoes. 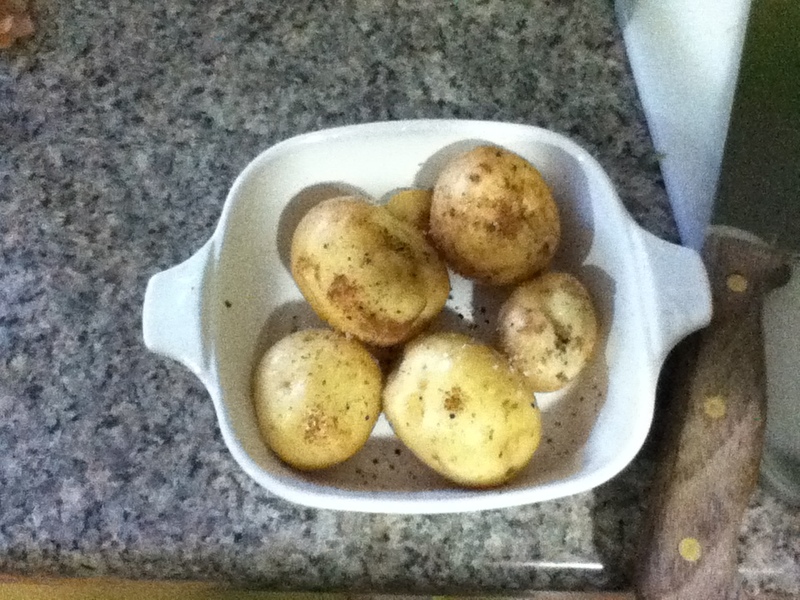 Here is my new potato harvest, baked with salt, pepper and olive oil. Turns out they are the Yukon Gold variety- one of my favorites! I cannot tell you the joy of knowing my over-purchase has yielded something productive. 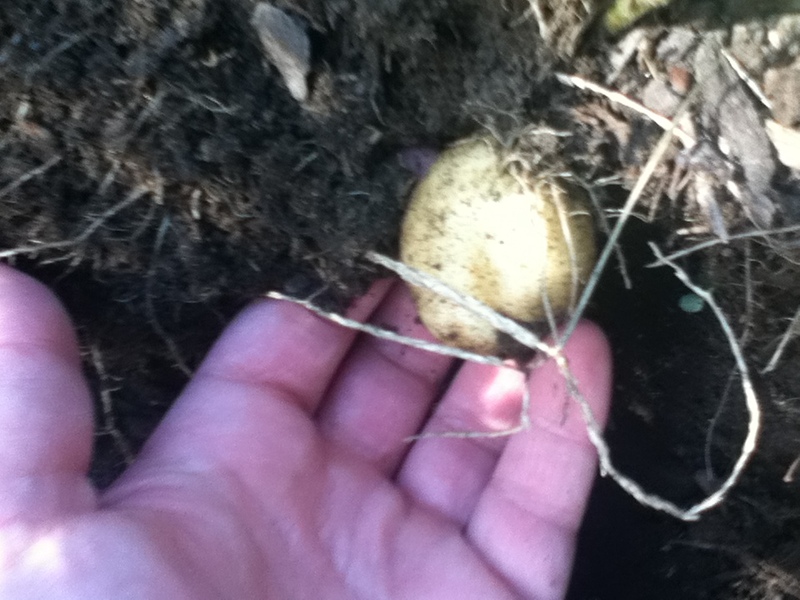 I am hoping next year to grow some potatoes on purpose! So if you ever find something sprouting in your cupboard, don’t automatically think it is ready for the trash. You may have a tasty, fulfilling addition to your DIYet! Give it a try!